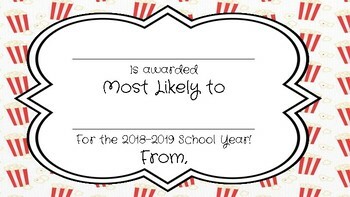 As the end of another school year is approaching, I start thinking about my End of Year Awards Ceremony! 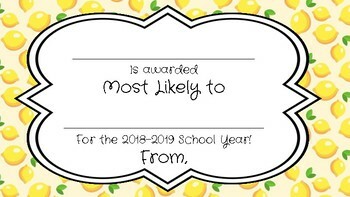 I love giving my students funny awards at the end of the school year! These awards are adorable! This set contains 30 different award backgrounds. You can print out the whole set and give a unique background to each student, or choose the same background for everyone and print multiple copies. 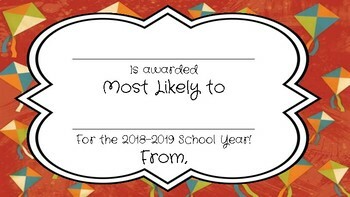 Write in the students' names, what they were "most likely to..", and sign your name! That's it! "Most likely to.. be covered in dirt after recess." "Most likely to.. read through my entire library." "Most likely to.. be caught flossing." "Most likely to..be the finder of all lost notebooks." and "Most likely to.. be humming a song while working." 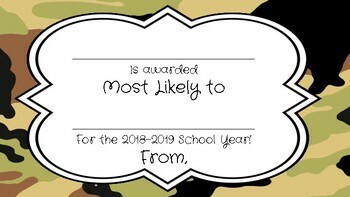 When my students from last year wrote me memory letters, they ALL wrote about getting their funny awards at the end of the year. This activity is sure to please!